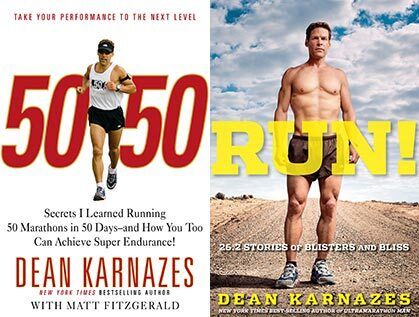 Dean Karnazes does not sit still. America’s most famous ultrarunner ran up to meet me in a park near his home in Ross, a quaint and affluent town north of San Francisco, and politely declined to sit at my side on a bench. “That’s OK, I’m good,” he said with a big grin that cut across his long, square-jawed face. Then he started doing squats and calf stretches. His smile revealed tiny, barely visible white hooks on a couple of teeth, which are part of his concealed orthodontia, odd for someone his age—he turned 49 last August. His wife, Julie, a dentist, installed them after his 75-day, nearly 3000-mile run from Los Angeles to New York dubbed the “Run Across America,” that he completed last spring. Long stretches of his 40- to 50-mile daily runs were along a narrow highway shoulder with big rigs repeatedly zooming by and honking. “I was clenching my teeth and literally made them crooked, and my jaw started hurting,” he explained. Karnazes wore running shorts, a singlet emblazoned with his main sponsor, The North Face, and a backpack to carry stuff, since he literally runs errands around town. The stretching movements on his 5’9″ frame made his veins pop and muscles flex in heightened definition under his tan, taut and seemingly hairless skin. Our plan was to do an interview while running up some fire trails on the east side of Mount Tamalpais. He said he didn’t mind holding my voice recorder while we ran because he is accustomed to dictating into a recorder during long runs. That’s how he produced the first drafts of his 2005 blockbuster memoir—Ultramarathon Man: Confessions of an All-Night Runner—and his two follow-ups: 2008’s 50/50, about lessons learned while running 50 marathons in 50 states in 50 consecutive days; and his 2011 release, Run! 26.2 Stories of Blister and Bliss, a collection of humorous and reflective short stories that explore his relationship to running and to the people close to him. 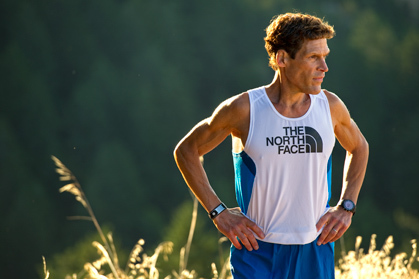 It’s hard not to feel intimidated by the prospect of running with Dean Karnazes. The New York Times wrote that running with him is “like setting up one’s easel next to Monet or Picasso.” This is a guy who has over 66,000 Facebook fans, who in 2007 made Time magazine’s list of “Top 100 Most Influential People” and who once stayed awake for three days to run 350 miles nonstop. A guy whose next big project is to run a marathon in all 204 countries around the world in a year. But Karnazes set a comfortable, conversational pace, and his form looked relaxed and balanced as we ran up a sidewalk in the leafy neighborhood. In fact, his whole persona seemed easygoing and regular—not exactly ordinary, because most runners aren’t so fit and photogenic, but not particularly special, either. Then he asked if I would mind tacking on a couple of extra miles on a trail that would take us to the neighboring town of San Anselmo, where he opened the “U-Top It” frozen yogurt shop in early 2011. “I just need to go by the shop to stick my head in and let the employees know I love them,” he said. “Of course,” I said, wanting more time together to hear about what motivates Karnazes to test the limits of endurance in places as unforgiving as the South Pole, where he nearly froze running a marathon in 2002, or as hellishly hot as Death Valley, California, where he finished the 135-mile Badwater Ultramarathon eight times and won it once. Over the course of our run and in subsequent conversations, he would reflect on how his goals have shifted over two decades as an ultrarunner and why he’s on a mission to change people’s lives by getting them to run. He would also open up about the criticism that his celebrity status has sparked. But for the first several miles, we kept the conversation light as he relished the climb up the mountain’s back side—“Isn’t this the best place in the world? It’s insane!”—and bantered about his two kids: Alexandria, 16, and Nicholas, 13. Karnazes has traveled an incredibly long way—literally, in terms of miles run on all seven continents, and, metaphorically, in terms of his personal evolution—since a fateful night in 1992, when serendipitous circumstances turned him into an ultrarunner. “What really got me going was bad tequila. I had a midlife crisis on my 30th birthday in a bar in San Francisco,” Karnazes explained to a crowd at a book signing a few months ago. In his memoir, he details how he got seriously loaded for the first time in years, and was hit on by an attractive woman. He loved Julie, whom he fell for back in high school—“not just some fleeting high-school infatuation, but genuine, head-over-heels love,” he wrote in Ultramarathon Man. On the verge of being unfaithful and knowing he’d regret it, he made an excuse to use the restroom, escaped through a back door and made it home. He stood on his porch and just felt like running—something he hadn’t done since high school, when he ran track and cross country in his Southern California hometown of San Clemente. He found some tennis shoes, took off his pants and jogged south in his silk underwear. On that nighttime run, he grieved the loss of his younger sister, Pary, who was killed in a car crash 10 years earlier on the eve of her 18th birthday, when Dean was an undergraduate at Cal Poly. Her death had devastated his close-knit, Greek family and prompted Dean to quit partying, earn an MBA and fast track a career in the marketing department of a health-care company. By the following year he had become an ultrarunning fanatic and entered his first 50-miler. When he heard about Western States, he told himself, “‘You gotta try to get yourself to that level.’ It wasn’t a desire to do well competitively. It was just, ‘Can you make it?’” He trained and, in 1994, finished Western States in 21:01. The next year, he attempted Badwater and passed out at mile 72. “It was a complete devastation not to finish,” he says. He went back to complete it in 1996 and entered a period of participating in extreme sports, including mountain-bike and adventure races. He also kept windsurfing, a sport at which he competed at a pro level during and after college. In that first decade as a serious athlete, though, he was like everyone else at the starting line, an unknown shoehorning his training in between managing a career and starting a family. 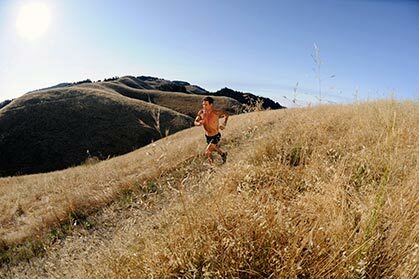 I first heard of Dean Karnazes in October of 2000 while riding in a van packed with sweaty runners on a back road of Northern California’s wine country. Our van represented one of dozens of 12-person teams competing in The Relay, a 199-mile event to raise money for the cause of organ donation and transplants. One of my teammates piped up, “There’s a guy doing the whole thing himself. He’s called Team Dean. Rumor has it he eats whole cheesecakes along the way.” 199 miles? It seemed unfathomable to me. But it was true. 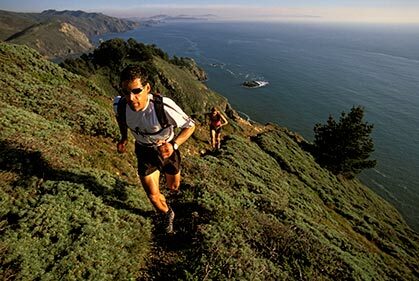 Dean Karnazes ran The Relay from Calistoga to Santa Cruz solo 10 times, starting in 1995 and most recently in 2009, refueling with unconventional food and drink purchased along the route: entire pumpkin pies, pizzas rolled up and held in his fist like a giant burrito and liters of Pedialyte. 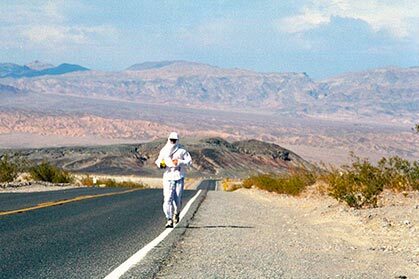 In 2000, he dedicated his 199-mile effort to raising money and support for the family of a dying girl in need of a liver transplant. The story had a happy ending: She got the transplant and survived. Then the story repeated in the following several years: Dean dedicated the annual run to a hospitalized child, and that child miraculously got the transplant or treatment needed to recover. In 2003, he founded Karno Kids, a nonprofit foundation to support programs for youth health and fitness. Not content to keep running “just” the 199-mile relay solo, he started adding miles to the course, either before or after the finish line: a total of 262 miles in 2004, and then 350 miles in 2005, which raised thousands of dollars for a two-year-old girl in need of a heart transplant. Writing a book was on his “life list,” says Karnazes, something he wanted to do but didn’t expect to be of much consequence. As it turned out, the publication of Ultramarathon Man in 2005 fundamentally altered his life. The book shot up the bestseller list—it was the No. 7 sports book worldwide that year—and made Karnazes a star. Suddenly, he was everywhere—on numerous magazine covers and TV shows such as Late Night with David Letterman and Today. Readers ate up the book’s comic details, such as his account of cramping to near rigor mortis after a race and projectile vomiting all over the steering wheel of his Lexus. And they gained motivation from his retelling of the times he almost gave up but didn’t, such as when he staggered around Mile 80 during his first Western States due to night blindness and passed out on the trail. But it’s more than athleticism and good storytelling that propelled Karnazes’ popularity and gave rise to the de facto “Ultramarathon Man” brand, which promotes everything from mattresses to elliptical bicycles. For that, credit is due to his well-honed business and marketing skills, relationships with sponsors and ability to connect with fans. Before the book was published, Karnazes developed a close partnership with his primary sponsor, The North Face. He started out as a shoe tester in the late 1990s and signed a contract in 2002 as a sponsored athlete. During that period, he developed a company, Good Health Natural Products, where he was president until he left in 2008 to become a full-time runner, writer and motivational speaker. 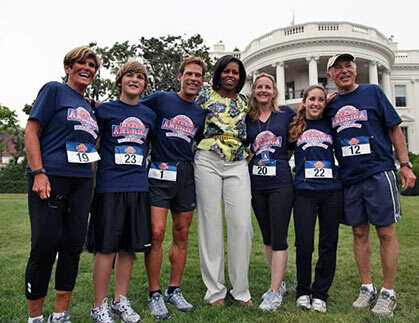 As he was garnering media acclaim for his book, Karnazes and The North Face were busy planning Karnazes’ first mega-staged event, one that would have a far-reaching legacy: “The Endurance 50,” aka 50 marathons in 50 states in 50 days, which would kick off in September 2006. A couple of months before Karnazes started the Endurance 50, he ran another Western States 100, won the Vermont 100 in 16:26 and completed another Badwater—all in a one-month period. Recognizing the logistical challenges—staging marathons on weekdays on certified-distance courses, gaining permits and closing roads, getting the crew from one state to another in 24 hours, providing aid for Karnazes and the runners who ran with him—The North Face hired Hawkeye, a marketing and strategic-planning firm based in Dallas. The Endurance 50 was a success, and Karnazes capped it off by running 3:00:30 at the New York City Marathon on his final day. Filmmaker JB Benna captured the journey in his film UltraMarathon Man, and Competitor magazine named Karnazes “Runner of the Year.” The project gave rise to the popular North Face Endurance Challenge Series the following year, which by 2011 had grown to two-day events in six cities, featuring distances from 5K to 50M mostly on trails and a $10,000 prize at its year-end championship, the most in U.S. trail running. What barely made it in the mainstream press, though, was the fact that another ultrarunner—Sam Thompson, then 26, originally from Mississippi, now living in Seattle—was nearly finished with his own 50-50-50 run when Karnazes started The Endurance 50. Actually, Thompson ran 51 marathons in 50 days in all states, squeezing in an extra marathon in Washington D.C. He had embarked on the project to raise awareness for the Gulf Coast communities devastated by Hurricane Katrina. Nonetheless, Thompson gained support and sympathy from ultrarunners who admired his low-key, low-budget approach in contrast to the hoopla surrounding Karnazes, and who were annoyed at the general misperception that Karnazes was the first and only runner to do 50-50-50. The impression that Karnazes didn’t do enough to credit Thompson for being the first kindled a backlash and tarnished his reputation among many observers. According to longtime ultrarunner Rich Limacher, 61, of Matteson, Illinois, “I and others call him ‘Dean, Dean the Media Machine.’ … It’s when his marketing machine tries to trump everything truly great that the true champions have done, that’s when we who are serious about the sport’s integrity get our feathers all ruffled.”Dissing Dean came to head in 2007 when ultrarunning great Scott Jurek of Boulder, Colorado, expressed frustration in an interview about Karnazes, after seeing Outside’s cover proclaiming him “America’s Greatest Runner.” Jurek suggested Karnazes did not deserve that title, and that the media should focus on the “true champions” of the sport. Karnazes expressed mixed feelings about that label, “Ultramarathon Man.” He said the phrase came from an old article that called him that, and his publisher persuaded him to use it for the book’s title. Following the 50-50-50 project, Karnazes went on to win 2008’s 4 Deserts race series totaling 1000 kilometers—the Atacama Crossing (Chile), the Gobi March (China), the Sahara (Egypt) and The Last Desert (Antarctica)—each self-supported over seven days and 250K. That same year, he ran 48 hours on a treadmill in the ABC-TV studio in New York, attempting the world record of 251 miles (he ran 211). The event was hell, he says, but provided an interesting moment when Senator Barack Obama, the presidential candidate, stopped by to say hello at the 42-hour mark. Moments before, says Karnazes, “I got off the treadmill because I was getting chafed, put a big goo of Vaseline in my hand, held my shorts down and did my thing.” All of a sudden, Secret Service guys ushered in Obama. The ABC event actually was his third major treadmill run that generated press attention and was derided as “gimmicky” by some ultrarunners. But in 2007, the company Accelerade approached him about doing a treadmill run in Times Square. The treadmill would be suspended on the side of a building, and the event would be broadcast live. Before Karnazes’ Run Across America began last February, the Hawkeye team meticulously planned the route from Los Angeles to New York and coordinated with WABC-TV in New York to cover the event on morning TV for 75 days. Brandon Friese of Denver, an independent contractor for Hawkeye and member of Karnazes’ support crew, said the team used two tour buses, one to transport Dean’s crew and another for the television crew. On most mornings, Friese received a call from Dean between 4 and 7 a.m.—“a lot of times he couldn’t sleep, so he’d want to get started”—and thus began a day of running 40 to 50 miles, which lasted between seven and 12 hours. Karnazes and his entourage reached D.C. in early May. Television from that day shows Karnazes running through the streets with a pack of schoolchildren following his lead and the television host Kelly Rippa jogging at his side. They ran through the gates to 1600 Pennsylvania Avenue to the White House lawn, where Michelle Obama high fived the school kids, greeted Karnazes’ family—who had flown out for a White House tour—and hugged Karnazes. How will Karnazes one-up himself next? Go global. Tentatively called RunWorld, Karnazes’ next big thing is to run a marathon in every country over the course of a year, starting in late 2013 or 2014. He envisions people in each country running all or part of a marathon with him, and raising money for a charitable cause in each nation. “It takes millions of dollars to pull something like this off,” he added. He’s hoping to secure $4 million to $5 million in funding and says he is close to signing deals with major sponsors and a media partner. 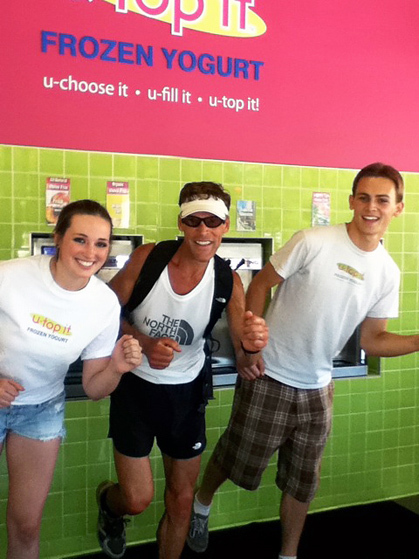 We reached Karnazes’ frozen-yogurt shop at the end of our run, where one worker offered him some new chocolate toppings to try, but he passed. “I used to eat junk food, tons of junk food, but I don’t anymore,” he said. 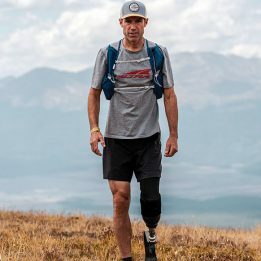 Karnazes, who had barely broken a sweat, said he was happy to squeeze in a midday run, because he was preparing for the Gore-Tex TransRockies Run, a five-day staged race, and he needed some heat training. 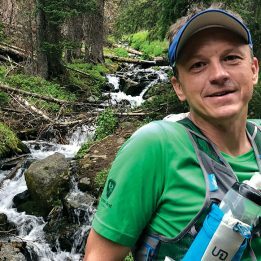 At the TransRockies Run, he and the race organizers launched “Run a Day with Dean” that gave journalists and contest winners the opportunity to run at Dean’s side. At The North Face Endurance Challenge Series events, he also acts as host and ambassador—not competitor—by introducing each race and running part of the way with runners. His role at these events typifies his less competitive approach to running now. But he misses racing and says he may toe the line at some events in the coming year. 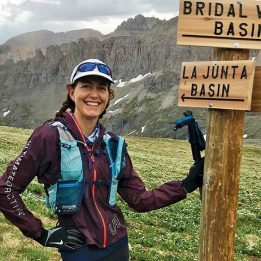 Sarah Lavender Smith is a Bay Area writer who blogs about trail running and travel at TheRunnersTrip.com. This article originally appeared in our January 2012 issue.